WWE Legends house went Larping, in sneakers. What do you put on your feet? 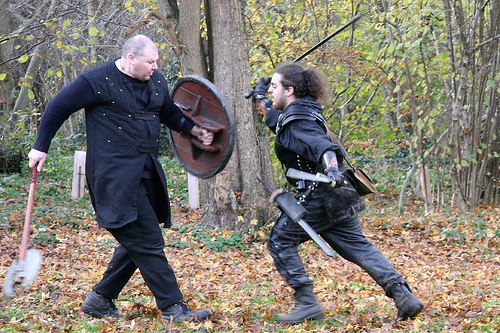 This is so hard because most people have plenty of modern sneakers and boots, but they look terrible in a larp setting. Most designs for sports are brightly colored, ventilated and plastic. Definitely not ‘period’. 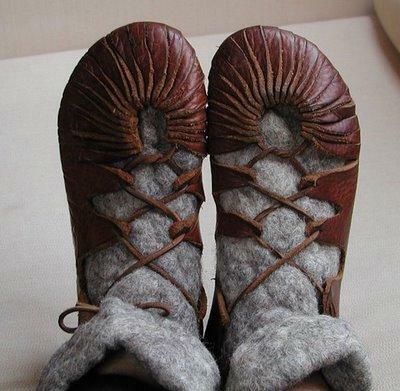 Modern foot wear is a reoccurring problem for all new players joining larp. Even modern leather boots that would otherwise be great have zippers, which are mainly products of the industrial revolution. There are plenty of riding boots which would other wise be perfect, except for the zippers. 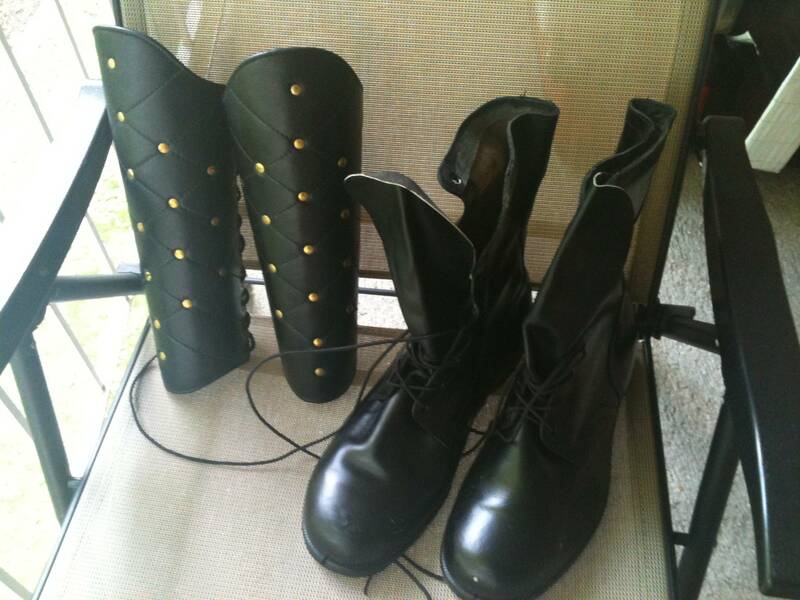 So here are some solutions to all of the problems of modern foot-gear in fantasy larps. Take a look at the guy in blue, and the one in brown and green. What do you notice, besides the ‘robin hood’ motif ? There is one thing wrong with each guy, and the issues are fairly easy to see. One guys has sneakers (and white socks) and the other has sun glasses (great boots though). Glasses in larp is an issue for another day. But how much better would this scene be if that foot wear was replaced with something more appropriate? When you walk out on the field day 1, or any day for that matter, do you want to have noticeably modern feet? Or do you want to tell a great story from head to toe? I should mention that most of these suggestion are not ‘period’. We are talking about larp here. When you have spells, magic and goblins ‘real’ goes right out the window. Better to have something that looks like it fits the overall theme of your character. If you gotta have period foot wear you certainly can, just realize that most of these solutions are still modern solutions, just made to look older. For anyone with foot related health concerns this is a great boon. 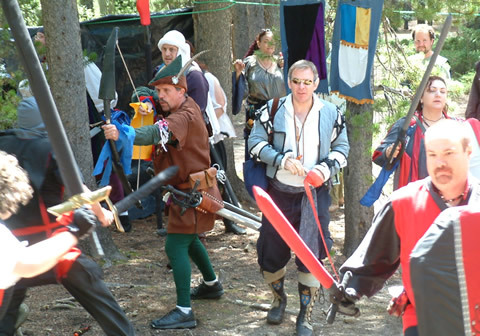 There are three basic solutions to problem of footwear for use in larp: expensive, less expensive, and cheap. You can purchase special boots, shoes or sandals. This is generally an expensive option. You can make historic inspired or historic copies. Possibly expensive in materials, definitely expensive in time. And finally you can use modern boots and cover them with something that looks good. Solution 1: Buy expensive, but amazing gear. First up the expensive solutions. If you have $300 (or more) head over to Sons of Sandlar. The pictured boot is a $240 dollar Merchant Boot. Many of their products are of similar quality which have modern sole, with a styled leather upper. No visible modern metal gear. Theses should work well for most games, and redditors report them lasting for years of combat use. Alternately House of Andar has $200 boots with equally long use being reported. Making them yourself means you have vastly more control over how they look. Perhaps your character is not supposed to be a rich merchant (because those Sandlar boots definitely say “RICH MERCHANT”). Maybe you want something more iron age like Roman or Viking. If you have the resources and the time you can follow all kinds of patterns and tutorials to create something unique. Now the soles may not be perfect for combat, but the fit will be amazing! Photo by Flickr user Bifford the Youngest. These guys have great garb (little too much black) but modern boots. They are so close. Cover those with some greaves from various locations online and they’d be much better. When just starting out, or getting back into larp, like myself, this is a great option. My current boots are leather combat boots with greaves purchased from Amazon of all places. They look a little too shiny at the moment. But they will get some use shortly. The leather greaves cost under $80 with shipping and work extremely well. They cover the most modern parts of the boot (the laces). They give good protection for my legs from the real terrain in the woods and count as leather armor in combat. Check with your game system to make sure they count as leather armor. This option is cheap if you already own the foot wear you want to cover. For an even lower cost option search for Winingas. A pair of sandals and home made winding inspired by winingas make for a cheap solution. Generic cloth from the craft store would generally be best for a new player at their first event. Upgrading to a nice pair of hand made, authentic winingas is much lower cost than many other solutions. Such that Event Holders could use them as a reward in game. Rewarding new players with garb is a great way to get them back, and show them they’ve done a great job. It also fixes newbie garb issues. For U.K. readers you might want to check out Larp.guides solutions. There are some cheap solutions. Apparently there are some amazing modern waterproof boots on offer in stores. Regular everyday people just walk around in garb quality footwear. Magic. Last, but not least, thanks to the folks from /r/larp. Thanks to MadnessOverMethod for posting about boots in the first place. The companies and store links came from the great people there! They are a great subreddit, and overall more positive and supportive than many of the others. If you have any larp related footwear questions you can tweet me. Or leave a comment. If you want to participate in some boffer combat and live in the New England area, check out my Larp Practice FB Group.